Join us in Pirate City – the spring training home of the Pittsburgh Pirates and the Official Southern Home of Baseball Factory – to compete in tournament play against top players from around the country to take home the Baseball Factory National World Series Championship Title! It’s full baseball immersion as you’ll train 10+ hours each day with professional scouts, former pro players, and former college coaches to take your game to the next level. This event is invitation-only. Our coaches work with you to make mechanical adjustments to your game. We aim to give you an advantage over the competition. Our coaches take your strengths and weaknesses and develop a game plan for improvement. Work with the Baseball Factory coaching staff on all aspects of your game. You receive instruction on hitting, fielding, pitching, catching, base running, and speed and strength training with a focus on the areas that will have the greatest impact in your development. You train from morning till night. This camp is all baseball, all the time. Play competitive games against athletes from across the nation as you battle to claim the title of Baseball Factory National World Series at Pirate City Champions. Experience the life of a pro as you play on the same fields and eat and sleep in the same facilities as the the pros. Players train in the same weight room, eat in the same cafeteria, and change in the same locker room as the Pittsburgh Pirates! If you want the chance to play at Pirate City, you need to attend an Under Armour Baseball Factory National Tryout Tour event in a city near you. *Please note: Itinerary & Rosters posted are from 2018 event. Information for 2019 event will be posted soon. Click here to return to Session 1. 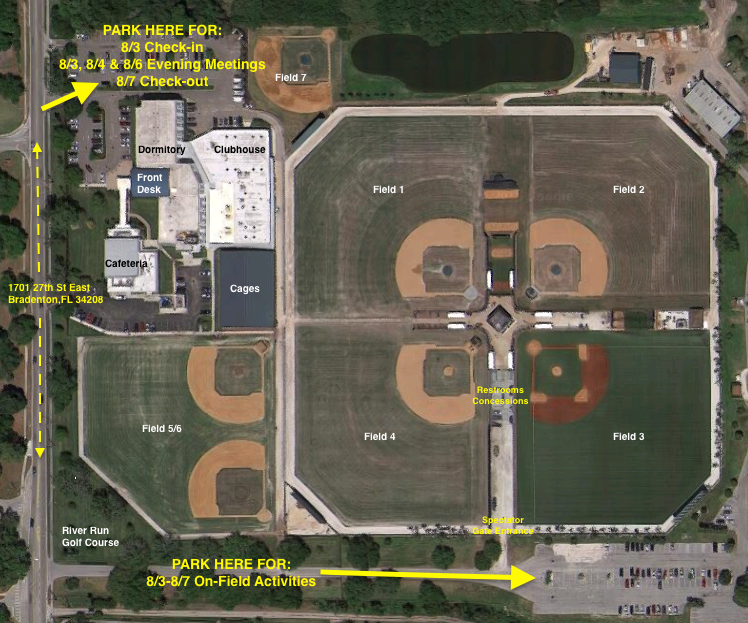 PLEASE NOTE: Our event is headquartered at the Pirate City Training Facility (1701 27th St East, Bradenton, FL 34208). Since McKechnie Field (another Pirates facility) is also located in Bradenton, many people report there by mistake — please note the address & link above to report to the Pirate City Training Facility. Check out the latest Instagram Photos from Pirate City.